We grew up with a health-ignorant diabetic father with the sweetest disposition and a very health-savvy strict mother who continuously educated herself about his condition and (unsuccessfully) tried to control his diet. As a result, in this emergence of this calorie-consciousness and nutrition-knowledge, the innocuous potato was nearly forbidden in our home. There was none of the daily “batata bhaji –poli” (roti) routine in the lunch box that was the staple of most of my friends at school. We were never given the option of a dumbed-down “kids’ meal” full of potatoes whenever our childhood enemies - karela and suran (yam) featured on the menu at home. Mother did not stock potatoes in the pantry but bought them in small batches as and when required. Most potato dishes were regulation boiled or stir-fried. Indulging in alu bondas or samosas from thelas or kiosks outside was frowned upon, while a fried potato dish to be made at home was deliberated upon with as much graveness as a fiscal budget. The sinful spud, which we now take as a permanent fixture at home, had bootlegged a premium value in our small minds. When Mother got the delivery of her glossy 20-volume set of the World’s Greatest Painters one summer, she sat with us and showed and talked us through the volumes one-by-one. I remember looking at “The potato eaters” as we went through the volume of her favourite “mad master” Van Gogh’s works. Chances are that I must have picked that painting because of the name. Children can be greedy. Very, very greedy. Chances also are, that Mother must have drawn our attention to the colours and brush strokes, to the gnarled hands of the peasants - so large and brown and knobby- almost like the potatoes they dug out from their fields. She would surely have told us that Van Gogh meant to show the farmers as rustic folk, enjoying their simple meal of potatoes and coffee with the gusto of glitzy gourmands. And it’s hard to believe that she hadn’t attempted to lead us from the colours, figures and expressions on the rustic folks’ faces to the underpinning social significance. Knowing her, Mother certainly must have. But I don’t know for sure. I was too fascinated to listen - by the idea of eating only potatoes for dinner. (Coffee was not allowed to us kids). "Even these poor people got to eat potatoes! Even the grown ups are eating potatoes! Are these potatoes baked like the ones from your childhood? Can we have only potatoes for dinner tonight?" Yes, my earliest thoughts around baked potatoes were evoked by Mother’s entertaining and tempting descriptions of how her grandmother and mother would just push oiled potatoes, sweet potatoes, eggplants and corn cobs into the burning embers of the coal or lakdi chulhas (wood fire stoves) of her childhood, or throw them into bonfires when camping on family farms. These were then taken out, the ash dusted and the yummy but incidental stuff was eaten hot. Some salads and spicy chutneys powders enhanced the flavours and textures. Drops of cold pressed oil or dollops of creamy home made yoghurt cooled and soothed the fiery chutney. These descriptions would make our mouths water. 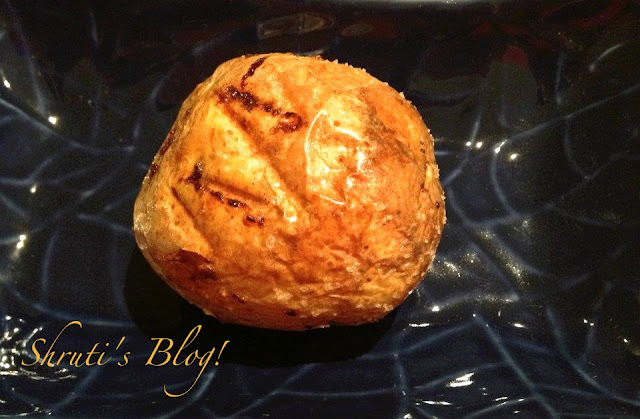 When I was exposed to the western baked potato, I took to it as if it was a familiar dish from my own childhood. 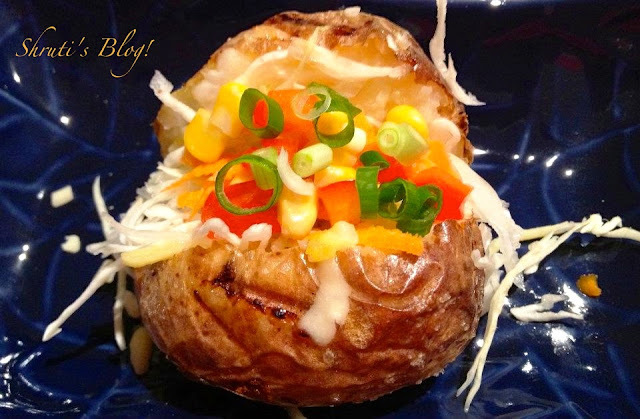 It was as if I always knew how eating a baked potato was a comforting thought, a gratifying experience. I must say that as more and more was known about potatoes over these years Mother too progressed from her petro position regarding the nutritional profile of the potato. This is my family’s favourite supper. 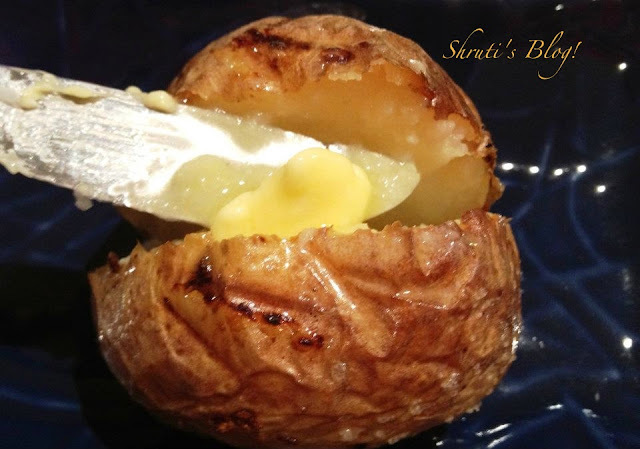 And I can bet my last ‘tato that my home baked potatoes are better than the ones at the Melbourne latest potato hotspot “Spudbar”. Some varieties of potatoes lend themselves better for baking, the most popular being King Edward and Russet. But when you can’t access these, any good quality potato with clean unmarked skin and with the sprouts removed bakes well. Contrary to popular belief, potato in its baked form is actually quite healthy and low fat (you will need to skimp on the toppings here). It has complex carbohydrates, iron, potassium, vitamin C and dietary fibre. 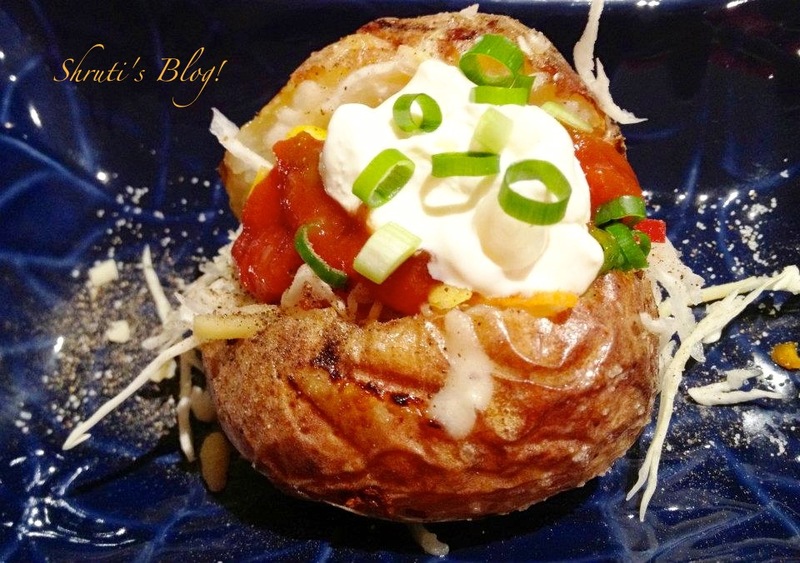 The toppings can be simple or you can doll up the humble spud with exotic toppings, making it a gourmet dish. Garlic Butter or plain butter. 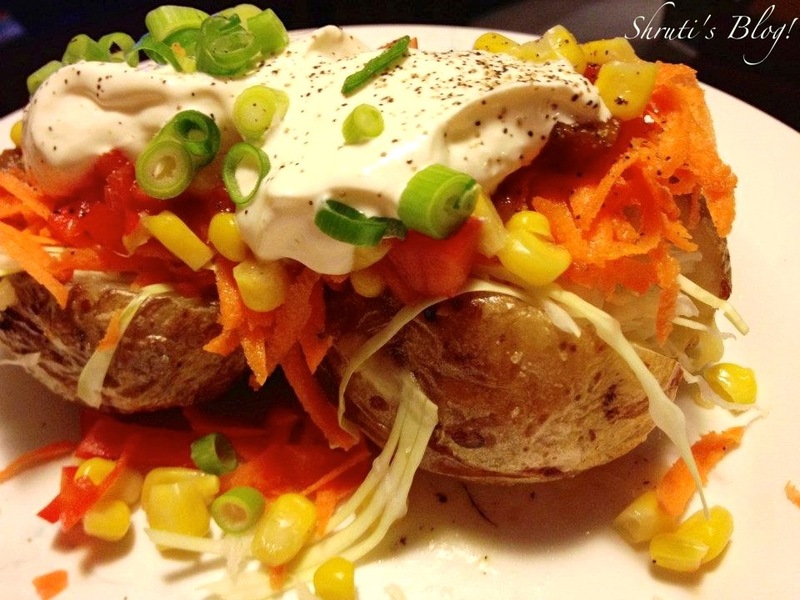 The more and varied toppings (preferably healthy) on the spud, the better, and you can let your imagination run wild. Wash the potatoes, gently scrubbing potatoes to remove the dirt, marks or sprouts and dry them. Prick the potatoes several times with a fork so that the steam escapes and the potatoes do not explode. Lightly coat potatoes with olive oil and rub salt onto them. Alternately, place them on a thin layer of rock salt. Bake on the middle shelf for approximately 1 hour and a bit, until the skin is crispy and the potatoes are soft and fluffy on the inside. You may have to turn the potatoes once or twice to make sure the potatoes bake evenly. Keep the toppings ready while the potatoes are baking. 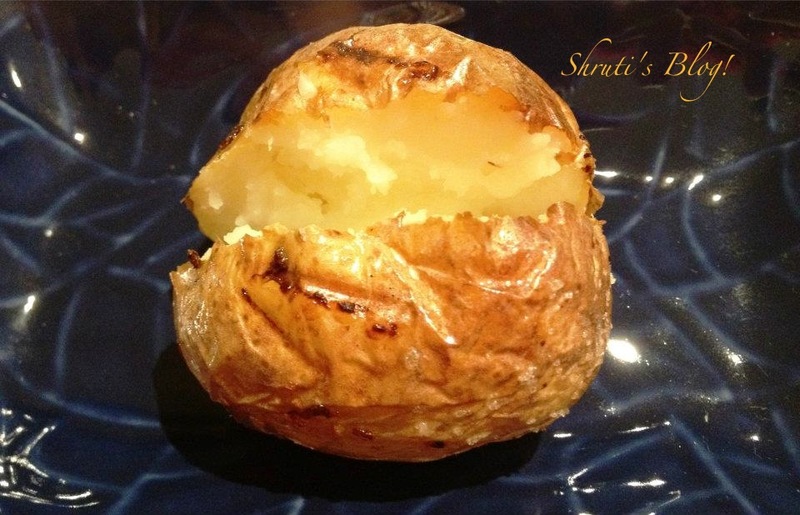 When the potatoes are baked, prepare them for serving by cutting a dotted line across the top with a fork and squeezing both ends towards each other to open it up. Sprinkle salt (check if you need any) and freshly ground pepper. 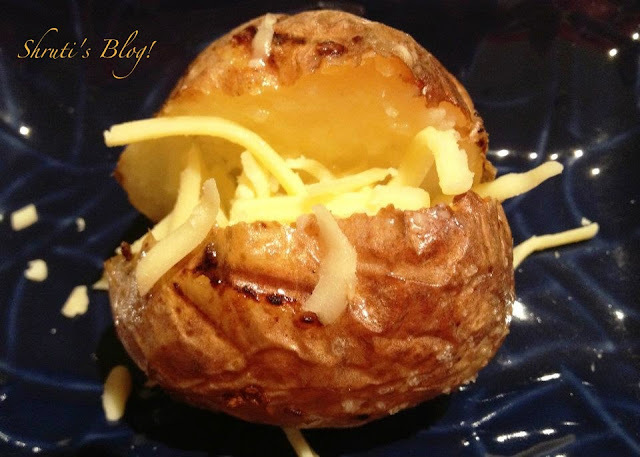 Lash the cut potato with garlic butter and sprinkle grated cheese so that the heat of the potato starts to melt the two. Now add all the salad toppings, salsa or baked beans then top it with sour cream or hung yoghurt and sliced spring onions. Thanks Megha - me too!